Global Funding - Bulk Funding in fancy dress - why it's a bloody bad idea. On Tuesday 9 August a momentus event happened. NZEI and PPTA launched a joint campaign to educate the wider public about the Education Funding Review. They also announced there will be fifty joint Paid Union Meetings held around the country from Monday 5 September. We are currently in the middle of them. And I will be attending my Paid Union Meeting in Hamilton with bells on this Monday 12 September. 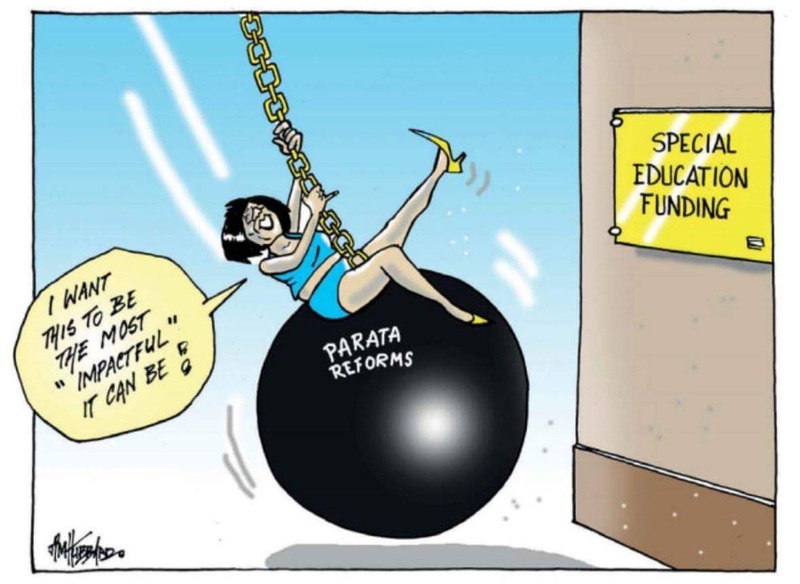 The review was set up by the Minister of Education, Hekia Parata, due to the decile funding system currently used to fund schools being seen as "a blunt object". Many different groups were asked to participate in the review, including Louise Green the NZEI Te Riu Roa president and Angela Roberts the PPTA president. To date, no one from the Education Funding Review Panel has stood up and said publicly: "Global Funding is great and we support it". Absolutely no one. Hekia Parata is disappointed in this action and she told journalists that no decisions have yet been made, that consultation is continuing. She claimed that NZEI and PPTA had left the Review table. A no point did either Louise or Angela say that either organisation was withdrawing from the Review. On the Paul Henry breakfast show (8/9/16) Hekia said that teachers had had many opportunities to be consulted as the Ministry of Education had run 80 roadshows around the country outside of school time. Where was my personal invitation Ms Parata? I was aware of a couple of meetings - during school time when no working teacher could attend. Teachers simply were not enabled to attend these meetings, so Hekia is once again reinventing the reality of the situation (not unlike how she "has the support of the Special Education Association"). These Paid Union Meetings have been the only opportunity for teachers to be consulted. Watch Hekia Parata with Paul Henry here. And Paul Henry, these are Paid Union Meetings, not strikes. When the Education Funding Review was announced, Hekia Parata said that the panel would be reporting back to her before the end of August/first week of September. We expected an announcement from Ms Parata over this at the end of last week. She said on Paul Henry's show she was still awaiting the report and recommendations. I had been suspecting the Education Funding Review panel had reported back last week (not that she only received the report last night or this morning as she claims in the House today) and recommended that her proposals were rubbish and the panel would not support them. Hekia Parata has engaging in a round of PR opportunities over the last two days (Paul Henry 8/9/16, Radio NZ's Nine to Noon 7/9/16) trying to swing public support her way as NZEI and PPTA have garnered the lion's share of the media over the last few days. As I was in the middle of writing this, Hekia Parata released the recommendations of the Education Funding Review panel in Parliament during Question Time this afternoon, which I will discuss further down. While Hekia claims that NZEI and PPTA are being silly in holding these meetings, this is the two education unions being proactive because we don't trust Hekia and we want to make sure our voices are heard before it is too late. Louise and Angela sit on that working party that is to advise the Minister and are obviously concerned by what is being presented to them and what is being said. Hekia can say that nothing is set in concrete, but that is not the case. We can not afford to wait as Hekia suggests, because to do nothing is to let the public think we agree with these proposals. Teachers and support staff gather at Nelson College hall to hear from union representatives against government funding plans. 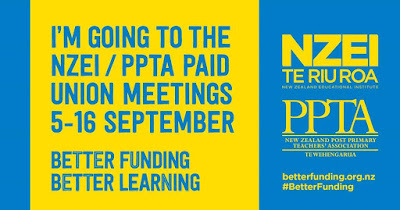 These meetings were planned for school time to send a very strong message to the Government as well as the wider community about the seriousness of the concerns NZEI and PPTA hold about Global Funding. It was considered that the inconvenience to parents and students for two to three hours was better than the long term, over a generation, that Global Funding would create due to under funding, higher class numbers and less teachers. The eighteen members of the Education Funding Review Panel went into the first meeting expecting a blank slate and the ability to brainstorm proposals. What they got was a wad of paper on the table by the Ministry of Education representative who said "This is what we will be looking at. That is the proposal." Hekia Parata can protest all she likes and say what she says to the media, but that was the reality of our representatives on that Education Funding Review Panel. This is about the government abandoning their commitment to staff schools appropriately and provide the best education for all children. Under the current system there are formulas for staffing according to the roll. Under Global Funding that goes. The result is that teachers will be seen as a fiscal risk and no new teacher appointments will be permanent - every teacher will have to reapply for their position every year and have no job security. Think about how this will impact any teacher's ability to get a mortgage to buy a home or plan a family. It also means that as an experienced teacher at the top of the scale I would be unemployable as I would be considered expensive. This will result in less teachers so then there will be a higher number of kids in every class as teacher:student ratios would go out the door. Less teachers mean a narrowing of the Curriculum. Six out of seven of the School Funding Review proposals will go forward for further work following the Funding Advisory Group's report on the proposals. The unpopular global budget proposal was rejected by the group, following intense opposition from teachers who feared a return to the days of bulk funding. Education Minister Hekia Parata says she was ‘not surprised’ by the Group’s recommendation that the proposed global budget not proceed to the next stage of policy development. “The Group’s report, and together with feedback from around 90 regional meetings with teachers and principals, will help inform my report to Cabinet on the options to take forward. The insight from staff right on the frontline of education is invaluable”, says Ms Parata. Well there is a surprise - NOT. No one wants Global Funding that was on the group. It was announced during Question Time in Parliament today. Here is the video, with an initial patsy question from David Seymour, ACT's only MP and the Under Secretary for Education, so watch if you have a strong government. Bright note was The Speaker telling David Seymour his questions slagging off our Paid Union Meetings were out of line. And the Funding Advisory Group agrees say in its report that it'd be too costly and risky. "Schooling sector representatives of the Advisory Group do not support the introduction of global funding for state and state-integrated schools and consider any potential benefits are outweighed by the costs and risks of implementation." However some of the group did note that with tweaks the plan could work and alternatives couldn't be ruled out in future. "If the risks around loss of clarity around staffing entitlement could be addressed in the global budget, there may be merit in exploring an alternative." Parata acknowledged strong opposition to the measure but was not prepared to take global budgets off the table ahead of a discussion by Cabinet. "We all know that children are different, therefore there will be different challenges in different schools, so the underlying theme is how do we give schools choices and flexibility. "The global budget is purely a mechanism for paying. It isn't about how we put together how much a school should get." Asked if it was too soon to say global budgets were "dead and buried", Parata responded: "Yes it would, because that isn't consistent with Cabinet process." I do not believe for a second that Global Funding is dead and buried in Hekia Parata's mind as indicated in the NZ Herald. That writer must be very naïve to take what Hekia says to be gospel. For Hekia Parata to push forward with Global Funding any further would be a folly. 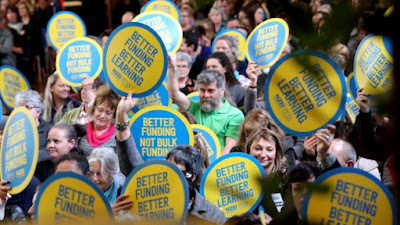 It is not just teachers wanting to have a "row" with the government as John Key implied on his morning breakfast TV rounds on Monday, it is a whole sector backed by parents who are not happy at the potential outcomes of Global Funding being implemented. I love Rod Emmerson cartoons. They cut to the core of the issue. This one is from 2012. 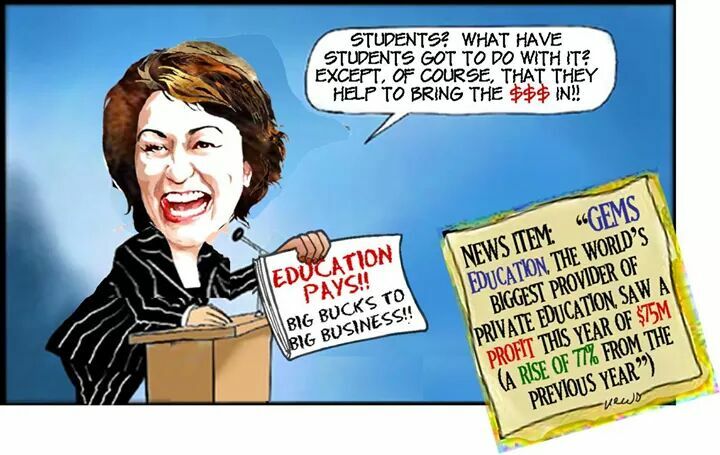 If Hekia Parata has not learned from her failed battle with class sizes in 2012, she really has failed the standard as a Minister of Education. 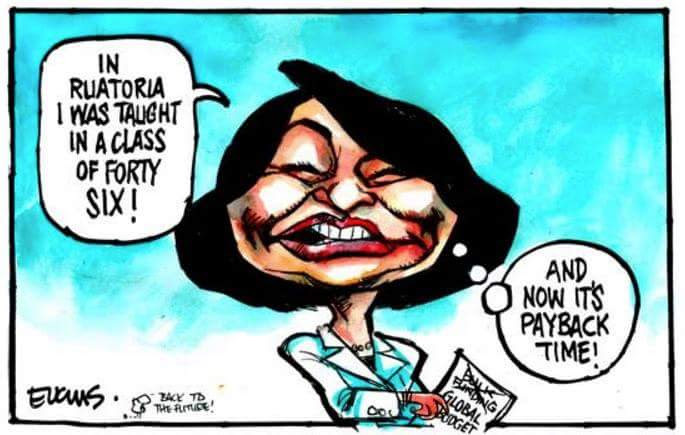 Hekia had 46 kids in her class and she was taught well - how would that go in today's classrooms? On Sunday morning I woke up to this article in my Twitter feed, an opinion piece from Jonathan Milne titled: A good teacher can inspire anywhere - but small classes help (4/9/16, www.stuff.co.nz). "I went to Manutahi School in Ruatoria," she told me. "I got in touch with my old teacher there recently, and he told me there were 46 children in my class, and that wasn't the biggest class in the school. We got taught well." This is a classic that is often thrown out by people who think they are experts in how school should be because they went to school. My grandmother went to school in the 1920s and often told me she had 50 odd kids in her class. But to know that the Minister of Education is saying this is horrifying because that shows she understands so little of what goes on in schools today and how teaching works. Minister Parata is currently 57 years old (I checked, thanks Wikipedia) so began school I expect in November 1963 when she turned 5 years old. Back then I assume it was not to dissimilar to when I started school in late 1978, wooden tables, wooden chairs. As you moved through the school you got a wooden desk with the lift up lid and the hole where predecessors put their ink bottles, and an incredibly uncomfortable wooden chair. My teacher had our class sitting in our year groups. Maybe Hekia's teacher did too. Maybe her teacher had them lined up in rows. Today I walk into a class and there are not enough desks and chairs for all the students - on purpose. In a modern learning environment, students do not necessarily have to sit at the desk. They may be on cushions on the floor or standing at a standing desk, all their possessions stored in a cubby or tote tray. I just thought though after reading Mr Milne's opinion piece that Ms Parata needed a reminder of what having 46 students in a class today would be like - she needed a reality check. So I tweeted her, 34 times, to get my thoughts across. So let's look at what is different from the 1960s when Hekia was at primary school to 50 years later when my first nephew started school, following by another nephew and niece. Let's compare their realities to Hekia's golden memories of her school days. 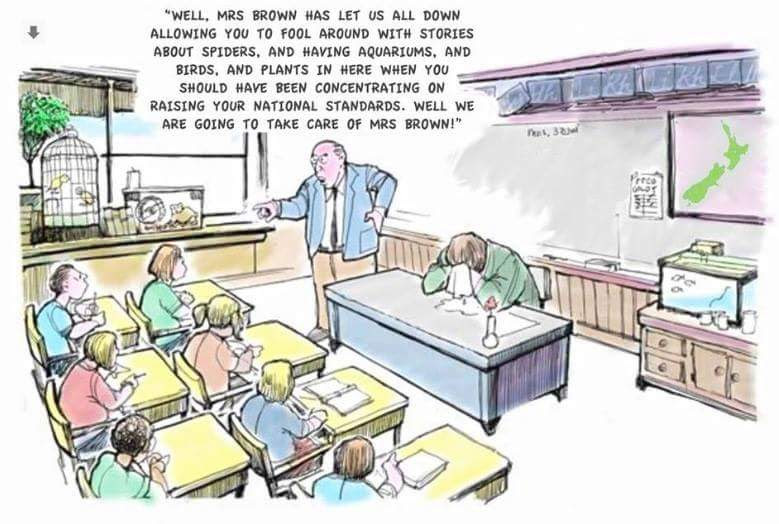 Well first of all, the biggest change, is we have a lot of assessment now compared to the 1960s and we have National Standards which means more reporting and graphs and stuff and it's all very intense compared to what Hekia's teacher did 50 years ago when s/he was teaching Hekia. And I did a bit of maths to explain this. Running records to assess reading were not around when Hekia began school. But imagine if her teacher had to do 46 quality accurate running records for 46 students. I estimated, conservatively, that this would take up more than a week of teaching time. Then there is gathering writing samples. The assessment and moderation with colleagues could eat up at least a week of teaching time if you all had 46 kids, because that would be 138 assessments to moderate. And some schools expect you to do this twice a term, which would be up to two weeks of teaching time to do a quality assessment of a student's writing ability. I reckon it would take at least another week to get through 46 kids to do either the full Numeracy assessment or JAM or Gloss accurately on every child... plus the time to monitor an IKAN assessment and mark and level those. Plus there are the administration of assessments like spelling, basic facts, Burt Word Test, PATs, STAR, and possibly e-asTTle for triangulation purposes and the time to mark and level all these assessment and record the data in a Student Management System (SMS) along with the data from the reading, writing and maths. That is at least another week of teaching time. And don't tell me PaCT will make life easier Hekia, because that will still be just as time consuming and an 'add on' rather than an 'instead of'. So far I think we have racked up four weeks of quality assessment of 46 students (conservatively) taking up important learning time. Who is going to release a teacher for four weeks to do assessment every term? Imagine trying to get quality assessment for that many students AND manage the class learning and behaviour at the same time!! So times for some times tables. If it takes me four weeks every term to get the assessment done for 46 students, that would be 4x4=16 weeks over the year of assessing instead of teaching. A teaching year is roughly 40 weeks, so 40-16=24, so that is only 24/40 weeks used for learning and teaching to get my 46 students to the Standard. Here is some more maths, putting those weeks into actual days: I have 200 (approximately) real whole days to teach. If I am assessing for 5x16=80 days and only teaching for 120 then I am using up 60% of my time with these children on assessment. It should only be 10% maximum. Then there are the meetings. Teachers are always going to have staff, syndicate, curriculum and appraisal meetings, but do not forget about the meetings they have with parents and caregivers, RTLBs, RTLits, Special Education staff, speech language therapists (if you can get one! ), and other outside agencies. Several years ago my class of 19 Year 4-8 students had six students with special education needs - Downs Syndrome, Global Development Delays, Dyslexia - a third of my class and this is not unusual in many other classes! With 46 students I would estimate 15 students would have special learning needs - that is a lot of meetings with parents and supporting agencies and a lot of writing and assessing of IEPs. Hattie, Hekia's favourite academic, argues that class size is irrelevant and quality feedback is what counts. So I am supposed to give all 46 students quality feedback every day. Good luck with that! When will I have time to develop my relationships with them, develop trust and know their little quirks and what they need when I have 46 students at once? How do I support the wellbeing of 46 individuals? How fair is that on the students? Speaking of wellbeing, let's talk about the wellbeing of teachers. 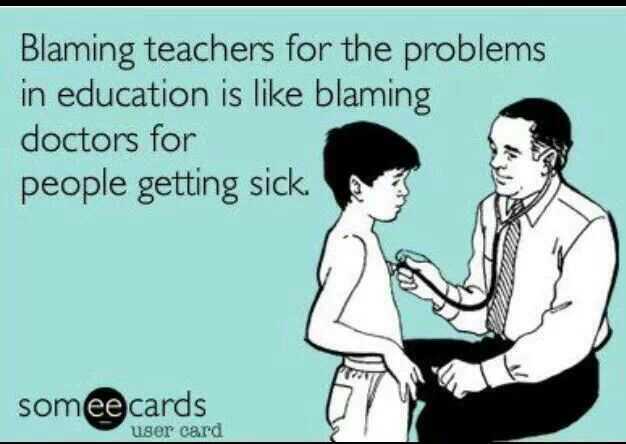 Teachers are wilting under the workload of their current classes. Imagine the chaos of teachers collapsing under the workload of 46 students. Imagine the damage to their mental health, let alone the damage to their relationships with family and friends. In December 2012 a mental health worker told me she had seen five teachers that last week alone. It's progressively becoming a bigger issue. Every week I see posts on NZ Teachers of people who are over worked and worn out, seeking support or claiming they are leaving the profession due to the workload. Personally, I am happier not to be doing the workload this year - studying is hard enough. We are losing great teachers out of the profession because the workload has become what two teachers should be doing - yet you think we could have 46 in a class! So how will one of your Teach First NZ teachers with their eight weeks of intensive training to be a teacher cope with 46 students in their class Hekia? So back to the classroom furniture we talked about earlier. Most schools struggle to fit 30 students and their associated desks and chairs into a standard classroom, let alone 46 students! And I'm not sure that you noticed Hekia that kids are generally bigger than what they were 50 years ago, so fitting 46 students in would be a big challenge.... but I guess you will solve that with Communities of Online Learning, aye Hekia. Ultimately, you need to remember that the teaching conditions of a teacher are the learning conditions of a child. So if we flipped all of these arguments to the child's view, it means less individual time with the teacher, as teacher who is not teaching as much, too many assessments, lost in a crowd of other students and having a teacher who is stressed out to the max. And this is what Global Funding could present to our schools. But that's ok according to Hekia. She was in a class of 46 and she was taught well. Thanks to the fabulous cartoonists of New Zealand for the illustrations. Hekia is giving you a lot of material, that's for sure. Love your work. My little rant about what is wrong with the current direction of education policy and what needs to be done. I have to tell you that once I get started it's hard to stop me. 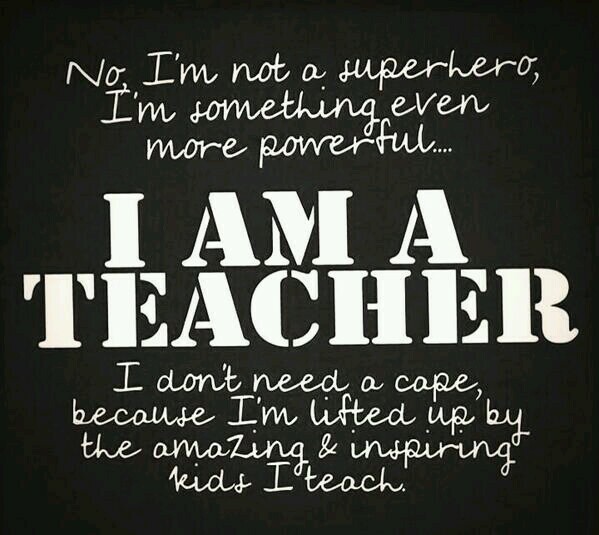 Essentially I am doing my Masters of Education this year. It isn't easy. Study is hard. Most other people with my level of teaching experience tend to go the Leadership route of Masters, but I decided to study Global Education Policy as I am very dissatisfied with where New Zealand education policy has been heading since 2008's election night. 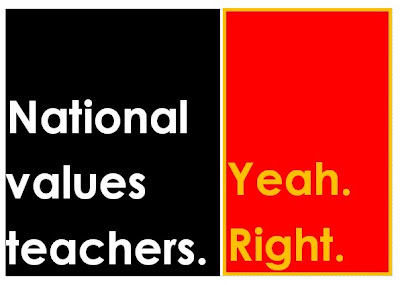 I greatly fear for the viability of our quality public education system and I honestly believe that there will be very little left of the quality and public part of our education system by the 2017 election and even less if National gets a fourth term in government. Anyhow, I figure if I dislike the direction so much I need to attempt to make myself more desirable as a person to help fix the education system once we enact our 2017 election plan to #ChangeTheGovt. I was at high school as a student when Tomorrow's Schools came into being (showing my age here), and fees to go to University were put in place in either the second to last or last year of me being at high school, so I ended up with a lovely big student loan, or though possibly not as big as others due to not needing it in my first year or to finish my last two papers (I took two years to finish my fourth year of my Bachelor of Education because I was working in schools teaching). My first year of teaching as a newly qualified teacher was in 1996, so I lived the 'excitement' of bulk funding and a new Curriculum document every year. 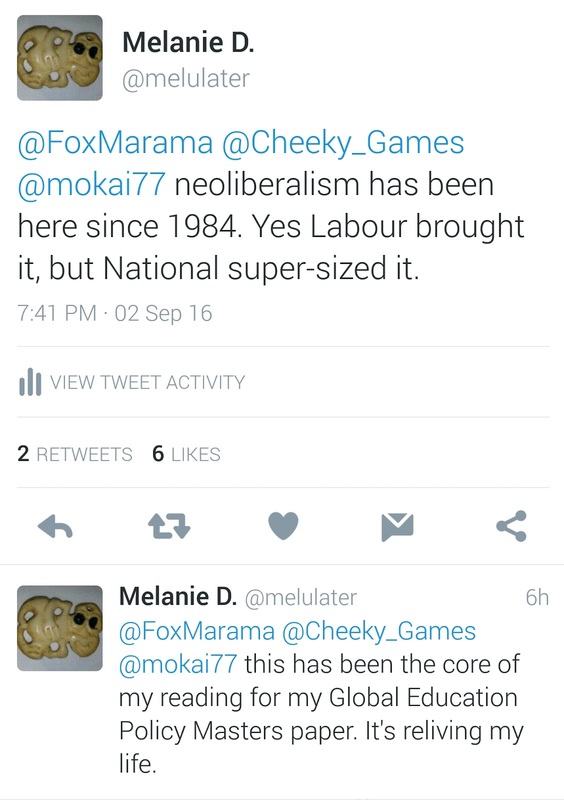 I lived Labour coming into power in 1999 and sweeping away bulk funding and a few other undesirable aspects of education policy under National. The 2000s to me were wonderful years to be a teacher. Lots of professional development and the use of ICT in education was really taking off. I had the freedom to teach pretty much what I wanted as long as I could fit it in with the achievement objectives of the curriculum and I met the needs of my learners. I knew my learners well. I assessed them, I talked to them, we worked side by side, and many of my classes were well oiled machines in the sense that they loved learning and took every opportunity offered. We had bright colourful rooms full of art and projects and charts they had made. I cried for New Zealand, education and my career on election night 2008. I had spent two years getting a Graduate Diploma in Information Technology in Education (GDITE) with the goal of becoming an ICT Cluster facilitator. I knew that dream was dead in the water as soon as National got in; it didn't take them long to say that 2009 was the last year for all the programmes Labour had put into action to develop teacher confidence in ICT as well as literacy and numeracy to run, because they wanted to put all that professional development money into National Standards. In the nearly eight years since that night every prediction Paul Gaulter, National Secretary for NZEI, made has come to pass for education in some form or another, leading me to do what I am doing this year. 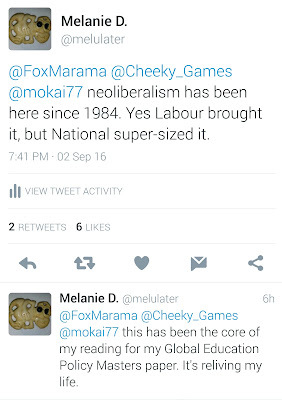 One of my papers focuses on the New Zealand education reform experience since 1984 under the neo-liberal theory of policy. Every lecture and reading has been reading my history of life. Most of it I remembered with reasonable clarity; some bits were clarifying; and a few bits were shedding light on something I hadn't realised. For example, I didn't know that the international tests that rank countries on education performance started in the mid 1990s; that National had been planning a form of national testing for primary students in the 1990s (thank goodness Labour won in 1999); and how even the Clark government was unintentionally edging us even closer to National Standards than what we thought during the 2000s. I oppose Charter Schools - overseas they have been shown to often have financial mismanagement, had money sucked out in profits, often hire unqualified 'teachers', use Teach First, their 'teachers' tend to teach to a script, high level of students expelled, unrealistic discipline, some have shut unexpectedly leaving students without a school to go to, achievement is no better than local public schools, some schools have 'fiddled the books' on their achievement statistics... just not good at all. country which has introduced a form of national testing has gone down the international rankings. The US and UK have had their system for years before we did and were so far below us you really had to wonder why our politicians insisted on chasing them downwards. In the ten years or so Australia has had Naplan, their rankings have plummeted and their students are becoming more and more disengaged in education. League tables sprang up in our newspapers as a result of National Standards. Make them illegal. Global funding is just bulk funding in drag. It will, just like it did in the 1990s, result in Boards of Trustees being pitted against principals and principals pitted against staff. Experienced teachers, like myself, will be deemed to expensive to hire, and to save money less experienced teachers will be hired instead of teachers like me. Under this scheme there will be no minimum staffing ratio, so class sizes will rise, and that is not good for students or teachers and will make parents most unhappy. Communities of Learning aka Communities of Schools is just the IES pig with lip stick and blusher. Any changes to it this year merely add eye shadow and mascara to the pig. I don't agree with how they have been set up because the whole manner of the set up makes it ripe to fail. The government has cherry picked the ideas of Michael Fullan and then come up with an idea ignoring two key ingredients: relationships and trust. To get these going requires time which this format does not have. 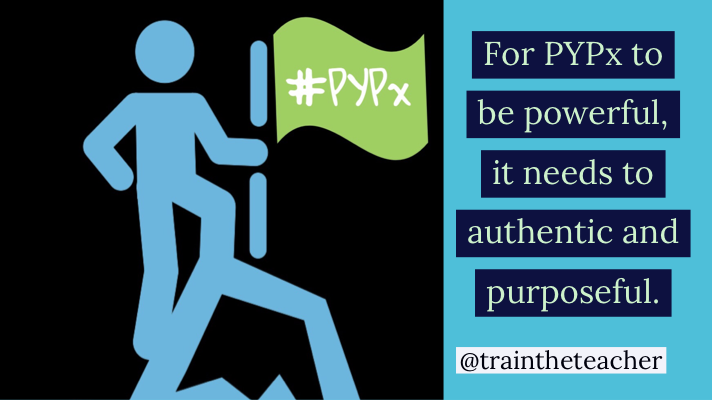 The idea of executive principals and expert teachers leaves me cold. Personally, I believe, any person who takes on these roles is doubling their workload for not much money at all. Initial teacher training programmes like the 8 week intensive Teach First NZ (University of Auckland) before being given your very own class and the one year Masters of Teaching and Learning (University of Waikato) displease me as much as allowing an untrained unregistered 'teacher' to teach. This devalues the profession, my BEd and the Masters I am currently doing. 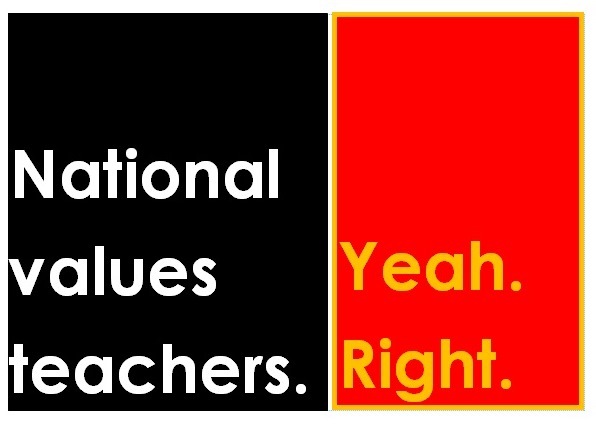 It is the complete opposite of Finland which sees teacher trainees in at least five years of study before they become teachers - that is how much the teaching profession is valued in Finland. The fact that so many 'teachers' in ECE are not actually teachers because they are not trained with a teaching qualification or are registered. This is just a way of making sure that they cut costs on ECE by putting untrained staff in looking after children while charging the parents heaps as well. We have the most amazing early childhood curriculum that untrained people are at a disadvantage because they have not had the training in that curriculum. Our tertiary institutions are starved of funding. They are cutting courses left, right and centre, and staff are running around trying to keep their own jobs intact. The voice of the academic is cut down and discredited by members of our government whenever they do their job and speak out about bad policy or dirty water or how earthquakes work. Research commissioned by various Ministries is shelved and embargoed if it doesn't meet the brief the Minister has laid down. This isn't the hallmark of an open democracy. There is a lack of quality professional development in everything for all schools, especially in the arts, science, technology, social sciences... And now with the advent of COLs, if you are not in a COL then your opportunity for PLD is even more limited. ECE teachers are even more disadvantaged when it comes to PLD. 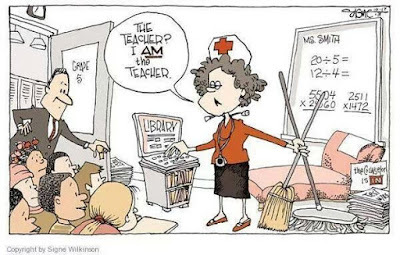 Workload has made the job as a teacher too big. 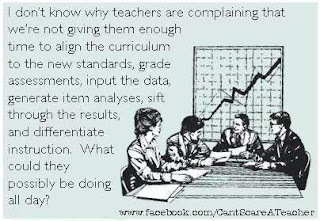 Teachers are now feeling like they are data collectors. Teachers are trying to cling onto the joy of working with students, developing the relationships and fostering a love of learning. But the grind of too much assessment, paperwork that doesn't directly relate to learning and onerous planning to justify their classroom programmes on top of far too many meetings takes its toll on a teacher's mental and physical health as well as their relationships with their family and friends. The rate of mental distress in the teaching sector is rising every year as a result and many are looking for a way out. Currently, being on study, I am the healthiest I have been in years, only just getting my first cold for the year towards the end of August, when I would have normally been on my fourth or fifth cold and probably on a second lot of antibiotics by now if I was full time teaching. Support staff are the backbone of every school, and they are the forgotten education workers when it comes to the government. They are not paid in the holidays as they are only paid for the hours they do each week. For most, their maximum hours will be 25-30 hours, so it isn't really a full time job. Many only work three hours a day... so 15 hours a week.... not much when the hourly rate is so poor and the majority are on a rate below the living wage. There is often no PLD for support staff, no career track, and little job security because when the school budget gets tight often it is support staff losing hours or their position all together to make up the difference. Special Education funding needs to be upped. Too many kids are missing out and a report released today shows (again) that students are being denied the right to their education due to a lack of funding, support staff, teacher education and opportunity to attend their school of choice. First and foremost a change of government with a new policy direction is needed urgently. 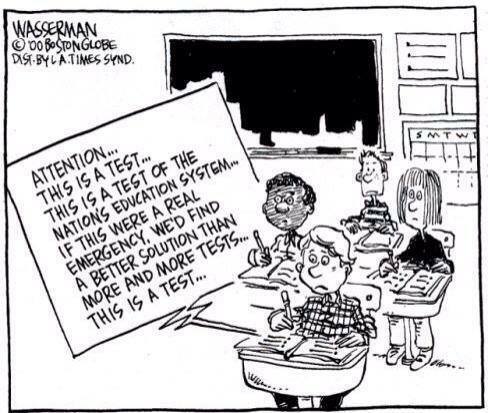 Get rid of National Standards and stop the obsessive testing regimes - let teachers teach. They will still assess, but it will be to inform them, not to keep some bean counter at the MOE ticking a box. Get rid of Charter Schools and redirect the money to our schools. Instead, start up some kura kaupapa and resource them properly and give the founding staff the ability to be innovative, just like the new state schools like Rototuna Junior High School and Hobsonville Secondary School have been allowed to do. Let's work towards that goal of having 100% of ECE teachers trained and registered. Let's not make PLD for teachers a contestable service - let's have knowledgeable and experienced advisors of curriculum available to be in schools and run courses that teachers need to be the best they can be. Let's up the wages of Support Staff to the living wage as the starting rate, provide job security and a career pathway for them. These people are often working with our most vulnerable students who need the security Support Staff provide. Our office staff are the welcoming committee of our school, so they should be valued as such. Improve the Special Education funding pool and make accessing it easier and more transparent for the children who need it. Give education back to teachers. You want innovation, flexibility and inclusion... well politicians won't deliver that. The other week I went to the #edchatNZ Conference at Rototuna Junior High School in Hamilton and I came away convinced that if you put education in the hands of those people who attended it would be a revolution. Finland doesn't have politicians messing with their education system. They trust their principals and teachers to get on with the job, and they are top of the pops when it comes to education rankings. For a more in depth look at how I think we can make the education system better, go to this post I did in 2013 that still stacks up today. While we continue down the current track we are failing our students. Our politicians are failing us as educators and parents by following this current policy. Our education policy really just fails to meet the standard it really should be.